3. Reduce heat and simmer for 5-10 minutes. 4. In another saucepan, melt margarine and set aside. 5. Lightly spray an 8-inch-square glass dish with cooking oil spray. Pour hot peach mixture into the dish. 9. Bake at 400° F for 15-20 minutes or until golden brown. 10. Cool and cut into eight squares. Nutrition Facts: Calories: 271; Total fat: 4 g; Saturated fat: less than 1 g; Cholesterol: less than 1 mg; Sodium: 263 mg; Fiber: 2 g; Protein: 4 g; Carbohydrate: 54 g; Potassium: 284 mg.
2. Lightly oil a 13- by 9- by 2-inch pan. 3. 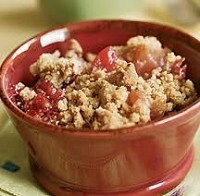 In a large mixing bowl, combine apples with sugar, raisins, and pecans; mix well. Let stand 30 minutes. 4. Stir in oil, vanilla, and egg. Sift together flour, soda, and cinnamon; stir into apple mixture about ⅓ at a time, just enough to moisten dry ingredients. 5. Turn batter into pan. Bake 35-40 minutes. Cool cake slightly before serving. Nutrition Facts: : Calories: 196; Total fat: 8 g; Saturated fat: 1 g; cholesterol: 11 mg; Sodium: 67 mg; Fiber: 2 g; Protein: 3 g; Carbohydrate: 31 g; Potassium: 136 mg.
2. Grease the bottom and sides of a square pan. 3. Remove the cores from the apples. Slice the apples. 4. Spread the sliced apples on the bottom of the pan. 5. Cut the margarine into small pieces and put in a medium-sized bowl. 6. Add the oatmeal, flour, brown sugar and cinnamon. 7. Using two knives, cut the margarine into the mixture until it looks like small crumbs. 8. Sprinkle the mixture over the top of the apples. 9. Bake in the oven for about 20 minutes. 1.) Use a soft margarine to reduce or remove Trans fat. 2.) For different tastes, try other fruits like cherries, pears, peaches, or plums. Nutrition Facts per Serving: Calories, 160; Calories from fat, 50; Total fat, 6g; Saturated fat, 1g; Trans fat 1.5g; Cholesterol, 0mg; Sodium, 50mg; Total Carbohydrate, 28g; Fiber, 2g; Protein, 1g; Vitamin A, 0%; Vitamin C, 6%; Calcium, 2%; Iron, 6%. Source: Adapted from: Pennsylvania Nutrition Education Network Website Recipes, USDA Snap-ed Connections. 1. Preheat oven to 350°F. Spray a 9x9-inch baking dish with non-stick cooking spray. Set aside. 2. In a large bowl, mix together oatmeal, flour, brown sugar, cinnamon, salt, and baking soda. 3. In a small bowl, whisk oil and 3 tablespoons juice together and pour over oat mixture. Mix well. 4. Reserve ¾ cup crumb mixture for topping. Press the remaining crumb mixture evenly into prepared baking pan. 5. 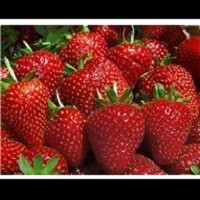 In a small bowl, blend jam with remaining 2 tablespoons of juice. Stir in dried apricots. 6. 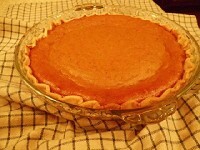 Spread apricot mixture evenly over crust. Sprinkle reserved crumb mixture over apricots. 7. Bake for 35 minutes or until golden brown. Cool in pan on wire rack. Cut into bars. 2. Peel the bananas. Put them in a mixing bowl. Mash the bananas with a fork. 3. Add the egg, oil, milk, sugar, salt, baking soda, and baking powder. Mix well with the fork. 4. Slowly stir the flour into the banana mixture. Stir for 20 seconds until the flour is moistened. 5. Lightly grease the bread pan with a little oil -OR- cooking spray -OR- line it with wax paper. 6. Pour the batter into the bread pan. 7. Bake for 45 minutes until a toothpick inserted near the middle comes out clean. 8. Let the bread cool for 5 minutes before removing it from the pan. Notes: The key to good banana bread is to use well-ripened bananas that are covered with brown speckles. Try using half whole wheat flour to add some fiber. Nutrition Facts: Calories, 140; Calories from fat,25; Total fat, 3g; Saturated fat, 0g; Trans fat 0g; Cholesterol, 20mg; Sodium,330mg; Total Carbohydrate, 26g; Fiber, 1g; Protein, 3g; Vitamin A, 2%; Vitamin C, 4%; Calcium, 2%; Iron, 6%. 2. Lightly spoon flour into a dry measuring cup. Level with a knife. 3. 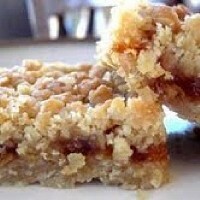 Combine flour, graham cracker crumbs, sugar, oats, butterscotch morsels, and baking powder. Stir with a whisk. 4. Combine oil, vanilla, and egg whites. 5. Add to flour mixture. Stir just until blended. 6. Lightly coat hands with cooking spray. 7. Press batter evenly into an 8-inch square baking pan coated with cooking spray. 8. Bake at 350° for about 20 minutes or until a toothpick inserted in the middle comes out clean. 9. Cool and sprinkle with powdered sugar. Nutrition Facts: Calories, 130; Calories from fat, 27; Total fat, 3g; Saturated fat, 1.5g; Trans fat 0g; Cholesterol, 0mg; Sodium, 80mg; Total Carbohydrate, 23g; Fiber, 0g; Protein,2 g; Vit. A, 0%; Vit. C, 0%; Calcium, 2%; Iron, 4%. 2. In a large mixing bowl, combine all ingredients except pastry shell; mix well. 3. Pour mixture into pastry shell. Bake for 15 minutes. 4. Reduce oven temperature to 350° F and bake for an additional 35 to 40 minutes or until a knife inserted 1 inch from edge comes out clean. 5. Cool. Garnish as desired. Refrigerate leftovers. Tip: If you really want to save fat and calories, skip the crust and continue the recipe as directed. You'll decrease the calories to 170 and the total fat to 0 grams! 1. Rinse fresh fruit. Chop into bite-sized chunks. 2. Open and drain canned fruit. 3. Sprinkle pudding mix over fruit. Add milk and mix toss well. Nutrition Facts: Calories, 110; Calories from fat, 5; Total fat, .5g; Saturated fat, 0g; Trans fat 0g; Cholesterol, 5mg; Sodium, 170mg; Total Carbohydrate, 24g; Fiber, 1g; Protein,2 g; Vitamin A,8 %; Vitamin C, 6%; Calcium, 20%; Iron, 2%. 1. In a medium bowl, mix strawberries, banana, orange, and pineapple. 2. Pour orange juice over the fruit and stir gently. 3. Refrigerate until chilled, 15-30 minutes. 4. Divide one half of the fruit mixture into 6 glasses. 5. Top fruit mixture with a heaping tablespoon of yogurt. 6. Add remaining fruit mixture to each glass. Top fruit mixture with remaining yogurt. 7. Sprinkle each parfait with crunchy nugget cereal. Nutrition Information per Serving: Calories 130, Total Fat 0 g (0% DV), Saturated Fat 0 g (0% DV), Cholesterol 0 mg, (0% DV), Sodium 60 mg (3% DV), Total Carbohydrate 29 g (10% DV), Dietary Fiber 3 g (12% DV), Sugars 21 g, Protein 4 g, Vitamin A 4%, Vitamin C 100%, Calcium 10%, Iron 10%. 1. 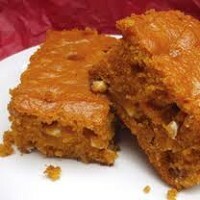 In a large mixing bowl, beat together pumpkin, sugar, oil, and yogurt. 2. In a medium bowl, combine the flours, baking powder, soda, cinnamon, and salt; add to pumpkin mixture, stirring until just moistened. 4. Pour into 2 greased 9x5x3 inch loaf pans and bake for about 1 hour. 5. Cool on a wire rack for 10 minutes; remove from pan and cool completely. Nutrition Facts: Calories, 110; Calories from fat, 20 ; Total fat, 2g; Saturated fat, 0g; Trans fat 0g; Cholesterol, 0mg; Sodium, 150mg; Total Carbohydrate, 21g; Fiber, 1g; Protein, 2g; Vitamin A, 40%; Vitamin C, 1%; Calcium, 4%; Iron, 4%. 2. Coat a 9 x 13 baking pan with cooking spray. 3. Combine all ingredients and beat well. 4. Pour into pan. 5. Bake for 30 – 40 minutes or until a wooden toothpick inserted in middle comes out clean (ovens may vary, check at 20 minutes). Nutrition Facts: Calories, 100; Calories from fat, 40; Total fat, 4.5g; Saturated fat, .5g; Trans fat 0g; Cholesterol, 0mg; Sodium,110 mg; Total Carbohydrate, 15g; Fiber, 1g; Protein,2 g; Vit. A, 30%; Vit. C, 0%; Calcium, 4%; Iron, 4%. 1. In a medium bowl, stir together sweet potato and banana. 4. Spray a 1-quart casserole with non-stick cooking spray. Transfer sweet potato mixture to casserole dish. 6. Bake in a preheated 325º F oven for 40-45 minutes or until a knife inserted near center comes out clean. *If egg substitutes are used, cholesterol will be lower. 1. To prepare filling, in a medium bowl combine sugar, flour, and lemon peel; mix well. Add lemon juice, apples, and cranberries; stir to mix. Spoon into a 6-cup baking dish. 2. 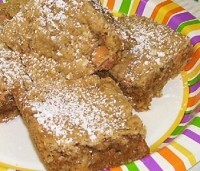 To prepare topping, in a small bowl, combine oats, brown sugar, flour, and cinnamon. Add melted margarine; stir to mix. 3. Sprinkle topping over filling. Bake in a 375º F oven for approximately 40-50 minutes or until filling is bubbly and top is brown. Serve warm or at room temperature. Variation: Summer Crisp: 1. Prepare as directed, substituting 4 cups of fresh or unsweetened frozen (thawed) peaches and 3 cups of fresh or unsweetened frozen (unthawed) blueberries for apples and cranberries. If the peaches are frozen, thaw them completely (do not drain). Do not thaw blueberries before mixing, or they will be crushed. 2. 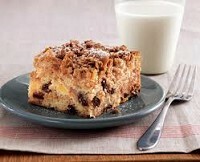 Arrange fruit in oiled or sprayed square pan (8 x 8 x 2 inches). 3. Mix remaining ingredients; sprinkle over fruit. 4. 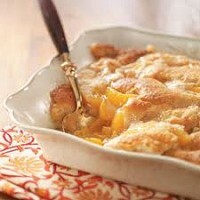 Bake until topping is golden brown and fruit is tender, about 30 minutes. 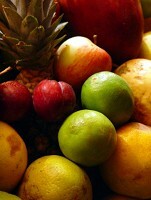 Notes: Use any fresh, frozen or drained canned fruit that you have on hand. Nutrition Facts: Calories, 230; Calories from fat, 70; Total fat, 7g; Saturated fat, 1g; Trans fat 0g; Cholesterol, 0mg; Sodium, 85mg; Total Carbohydrate, 43g; Fiber, 3g; Protein, 2g; Vit. A, 6%; Vit. C, 4%; Calcium, 2%; Iron, 4%.